No problem! Call now to get started. We offer beautiful, fully customizable modular homes at an affordable cost to our valued customers in Northern Indiana and Southern Michigan. We are a full service modular home builder, meaning we take care of everything from foundations to garages, and everything in between. DO YOU BUILD MODULAR HOMES IN MY AREA? We typically take on full “turn-key” jobs within a 50-mile radius of Goshen, Indiana, but we go further at times. Please call or email us if you’re unsure! Currently, in Indiana, we service Elkhart County, Lagrange County, Noble County, Whitley County, Allen County, Kosciusko County, Wabash County, Fulton County, Marshall County Starke County, LaPorte County, and St. Joseph County. In Indiana, we typically build Modular homes in Northern Indiana and North West Indiana, and we do some Modular Homes in North East Indiana. For those in Michigan, we service Berrien County, Cass County, Saint Joseph County, and some of Van Buren and Kalamazoo Counties. Top cities in Indiana include Elkhart, South Bend, Goshen, Mishawaka, La Porte, Plymouth, Nappanee, North Judson, Winamac, Rochester, Warsaw, South Whitley, Syracuse, North Webster, Churubusco, Kendallville, Angola, Lagrange, Shipshewana, Middlebury, Bristol, and Granger. In Michigan, our top cities include Sturgis, Constantine, Three Rivers, Paw Paw, Dowagiac, Edwardsburg, Niles, Cassopolis, Benton Harbor, Buchanan, and Three Oaks. In Michigan we typically build Modular Homes in South West Michigan, South Michigan, and some of South East Michigan. HOW DOES THE FINANCING WORK? We can help you get a loan! At Next Modular, we help our clients obtain financing for their new custom modular home by putting you in touch with some of the best financing options around. We work with a number of great local banks who are eager to help you build the modular home of your dreams. To build a new modular home, you will most likely need to secure a construction loan. Please see our blog Post “Construction loans – How do I get one?” for a detailed explanation on how to get a construction loan and how it works. If you are unable to obtain a construction loan or are interested in other loan options (such as FHA or VA loans), give us a call and we can discuss your potential options. WHAT DOES YOUR PRICING INCLUDE? The pricing on our website includes 1) the HOME itself (built to our standard specifications), 2) DELIVERY to your lot within 75 miles of our location, and 3) SETTING* the home on your foundation and completing the interior and exterior FINISH WORK after setting. *There is an allowance of up to $3,000 in crane fees. Anything over will incur an extra charge, but this does not happen often in our immediate local area. Also, the pictures and artists renditions you see on our website along with the floorplans typically show optional home upgrades, garages, porches and other things (such as landscaping and driveways) that will need to be priced out in addition to the modular home sale price. We price these on a case by case basis. WHAT OTHER COSTS SHOULD I PLAN FOR BESIDES THE HOME? For all homes the following items will have to be bid in addition to the modular home itself: the HVAC system (furnace and A/C), home foundation, building a garage or porch, all utility connections such as the well or water main hookup, sewer system and drains under home, electric service and hookup, gas service and piping hookup, tree removal if needed, landscaping/lawn seeding, gutters/downspouts, and anything else that is done on the property after the home is set on the foundation. Yes! As a full service dealer and general contractor; we can build whatever you want. We charge a 13% General Contracting fee on any site work that we manage for you. You are free to manage your own home building project. You can simply hire us to build, deliver and set a custom modular home on your foundation if you wish. However, many of our clients don’t have the time or desire to run a full-blown home building project, and they will instead choose to hire us as their General Contractor. We can handle every aspect of the building project for you, including obtaining building permits, hiring surveyors, and arranging for subcontractor specialists to clear the lot, dig and construct the foundation, put in the well and septic system (or hook to city utilities), build your garage/porch/deck, and anything else you would like done. Our General Contracting fee is 13% of all site work that is managed by us. DOES YOUR PRICE INCLUDE ALL THE OPTIONS SHOWN IN THE PICTURES? The pictures and elevation drawings you see on our website often show finishes and items that are not included in the home price listed. Here is a partial list of things that are considered upgrade/optional for your new modular home: Dormers on the home – garages – porches – landscaping – metal roofing – concrete driveways – stone veneer on home – premium vertical siding – dormers – kitchen appliances – stone countertops – solid hardwood doors – laminate or hardwood floors – premium cabinets (hickory, cherry, etc) – ceramic tile floors. All of these optional items and finishes will need to be priced out on an individual basis. Please contact us for a complete list of standard specifications for your home. Set & Finish includes setting and fastening the modular home to your foundation, fastening the various sections of your home together, crane rental fees (assuming normal lot conditions), finishing roof venting and ridge cap shingles, house-wrap and siding installation on ends, aluminum soffit and fascia installation, porch light installation, interior marriage-wall drywall finish and trim work, repairing any transportation cracks in drywall, ceiling texturing at the marriage wall, carpet and linoleum transitions, adjusting interior/exterior doors as needed, and final interior touch-ups as well as a final sweep and vacuum. Everything you need to get the interior of your custom modular home move-in-ready! Also, for all homes the HVAC system (Furnace and A/C), home foundation, garages, porches, and all Major Utility Connections such as well and water main hookup, sewer system and drains under home, electric service and hookup, and gas service and piping hookup are priced separately on a case-by-case basis. You can usually move into your home within 120 to 180 days, depending on the complexity of your project. 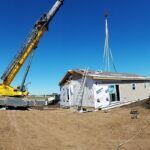 For custom modular homes in Northern Indiana and Southern Michigan, the current (Summer 2018) time frame is typically 120 to 180 days. The 120 to 180 day estimated time frame starts when we place your home order at the manufacturing plant. For an all cash purchase, we order your home as soon as we have a finalized list of home options/décor selections and your down payment. 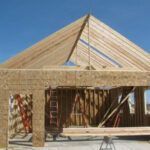 For a bank financed construction loan, we order the home as soon as the bank closes your construction loan and authorizes us to place the order.